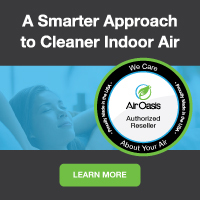 Maintain Clean, Safe Air Quality in Warehouses, Huge Truck Bays or Delivery Areas with this Top-Rated Multi-Function Fume, Particle, Vapor & Mist Collection System. Here We Offer The Best Large Area Ambient or HVAC-Based Air Purification Unit with Explosion-Proof Options and Quality HEPA, Carbon or Other Media That Can Remove Chemicals, Gases, VOC's, Gasoline, Diesel & Other Flammable Vapors. Also Eliminates Smoke & Toxic Fine Particles from Welding & Soldering Rooms, Big Woodworking Shops & Most Manufacturing Applications--All at A Discount Price with Free Shipping and 100% Made in USA! 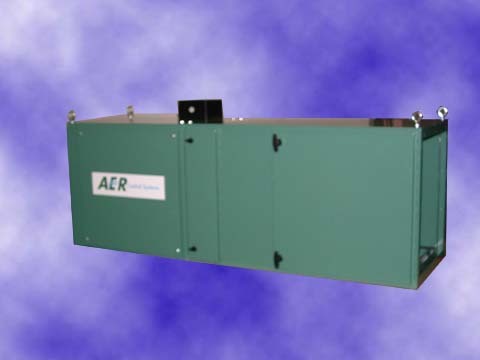 AER Control Systems’ Horizontal Media Collection Systems (HM) are designed to provide efficient, cost effective control of mist, dust, smoke, fume, gas and vapor contaminants generated from a variety of manufacturing and process applications. Our HM Series modular design provides the ultimate in unit filtration flexibility or adaptibility enabling them to handle a variety of airborne contaminants. Modular design allows for simple intergration of additional filter modules, which allows the collectors filter stages to be easily customized to meet the exact filtration requirements of the application. Should contaminants change due to process changes, existing filter modules can be easily added and/or altered to adapt to the new contaminants generated. 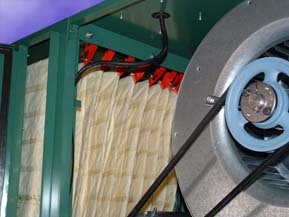 The HM series systems are the most flexible collectors offered in our Media Filtration Systems product line. The units can be applied as ducted, point source capture systems, or set-up as un-ducted systems to provide ambient air cleaning of the general plant air. In addition to standard Horizontal configurations, HM series units can also be set-up for vertical mounting or as portable mounted units that can easily be moved throughout the plant. At our online store, we make it easy for you to get the best commercial and industrial fume extractors at discount prices with free shiping due to our extremely low overhead. Call our specialists today at 1-800-701-2513 to discuss the specific filter configuration that will perfectly suit your application. We are here to help! 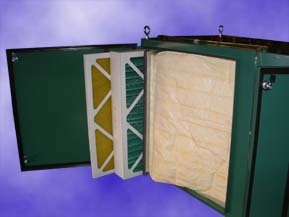 1 Filter System: Polyester pre-filter, 95% ASHRAE Box filter. CALL FOR FREE CUSTOM QUOTE DESIGNED FOR YOUR FILTRATION NEEDS!